I saw a commercial tonight. It was an advertisement for a bank - I can't remember which. It showed a man, well-groomed, sitting in a chair. He stands, puts on a jacket, a hat, a scarf. Then he just stands there, ready to go. He then takes the smart phone from his pocket, taps it several times, removes his scarf, his hat, his jacket, and sits back down. The ad effectively showed the foolishness of actually going to your bank to do banking. Why drive to the bank to make a deposit when you can do so from your home, car, or seat during a football game? Get it done now, from anywhere, because you deserve it. As the commercial ended, I couldn't help but feel angry. "What a lazy dope," I thought. Instead of marveling at the ease of online banking, my catalog of memories brought forth images of fat people in suits of red and blue sailing around in hoverchairs. Yes. 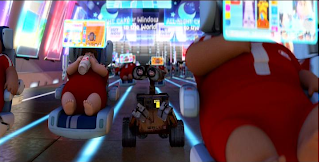 I thought of WALL-E. I remember watching this Disney delight for the first time and thinking, "Wow. We read your message loud and clear, Disney." The film's charming robots disguise to children what can be a fear for adults: we're losing ourselves. Is technology making us more lazy? Or is it freeing up more time so we can do other things? Although I think technology is great, I have my reservations about it. Yes, it's wonderful that we can text. It's very appropriate in some cases. Not so in others. It definitely takes away human element and can be very misleading. I remember when someone would actually care enough about me to make a personal invitation over the phone - with their voice - to a party rather than a thoughtless mass text. There are two kinds of Bluetooth users: those who understand the purpose of Bluetooth, and those who don't. I giggle inside when I see someone holding their phone in front of their face while wearing a Bluetooth receiver. The whole point of Bluetooth is to be "hands free." Is it really easier to have the phone a few inches away from your face? Why not go a few inches more, remove the Bluetooth, and use it like a normal phone? Apparently some people don't understand that you can leave your phone in your pocket and talk. Another technology I find amusing: electric staplers. Electric pencil sharpeners is something I can get behind. They're fast and can get your pencil as pointed as a needle. (I hated those sharpeners fastened to the wall. You change the angle of your pencil by a few degrees and you had to start all over again.) But staplers are hard to use incorrectly. You hit the top part hard enough to put the staple through the paper. I witnessed a man who would was using an electric stapler to attach two sheets of paper to each other and remember thinking how pathetic it was. The point is that technology goes too far in some cases. Here I am criticizing technology when I saw a commercial over the internet on my laptop, which I am now using to type this outrageously long blog post about nothing. Electric staplers will staple like 100 sheets of paper. Try that by hand. Trust me...this stapler could maybe do 20 pages, but he was using it for only 2. Sorry Brady - I'm a big supporter of electric staplers. Having a job that involves a lot of stapling, or mass stapling, as it sometimes is, I totally recognize the brilliance of that little technology. Even for just 2 pages. One time. So worth it.